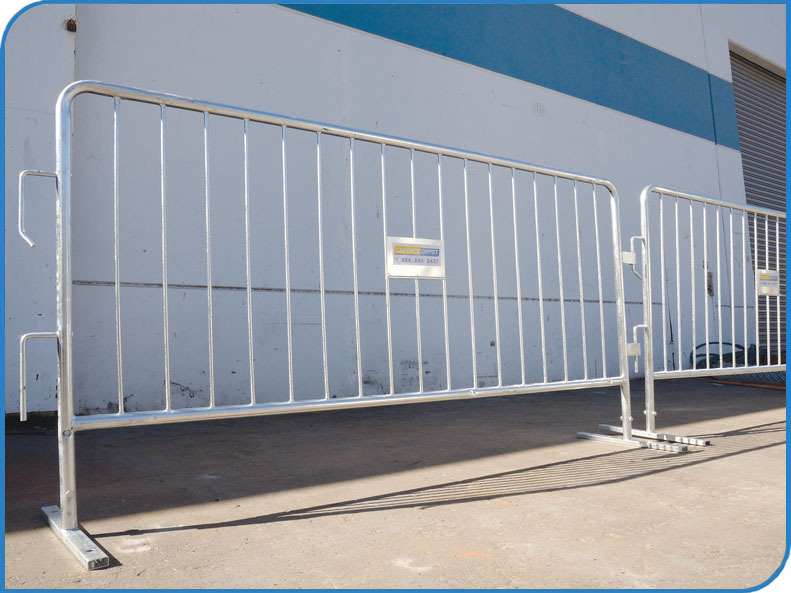 Product Name：Light Weight Crowd Barrier 1 3/8"
The outer frame (main frame)is made of 1-3/8” O.D. galvanized steel tubing, minimum 18 gauge.The outer frame is a single length of tubing without welds or deformation. Pipe is bent at right angles with a minimum of smooth deformation. Horizontal and vertical bars are at right angles to overall frame. 17 equally-spaced bars inside vertical membersmade of 3/8”O.D. galvanized steel tubing,minimum 19 gauge.Minimum of ½” weld at the top and at the bottom of each upright bar. 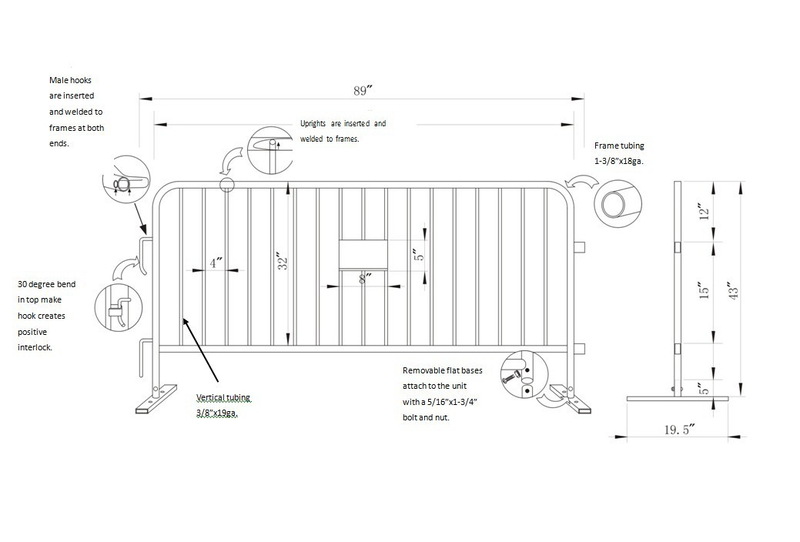 17 interior bars are 4” apart. Male-Female interlocking ends. Units join and unlock at one position (30 degrees). Male interlocking device is a minimum 1/2” diameter rod welded through main frame at both ends.Male-Female connections have enough clearance to allow for uneven ground, a minimum of ½” on top and bottom when connected. Steel panel plate 8”x5” welded to frame prior to hot dip galvanizing. Steel bar welded to the bottom of the sign plate is rounded so it will not pinch or cut your fingers;also can be used as a carrying handle. Two (2) bolt on flat bases ¾”x1-5/8” galvanized flat square tubing with 1-1/4” O.D.x12ga. Galvanized steel tubing. Entire panel is hotdipped galvanized after welding conforming to Marine specifications. Every barrier is filed after galvanizing so that burrs from galvanizing are filed smooth and there are no sharp points. 1-year warranty against manufacturer’s defects.